The USDCAD has completed a lap with a move down to 1.3300 level (natural support level), followed by a move back up to the highs. The lows on Thursday and Friday stalled ahead of the key 100 day MA (today it is at 1.3288). 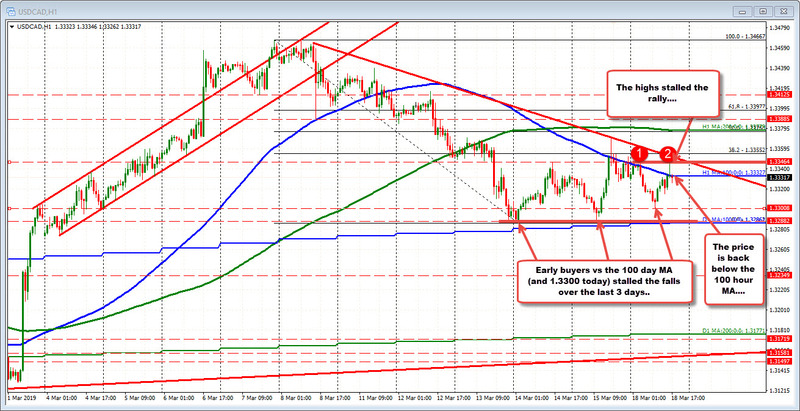 A move below the 1.3300 and then the 100 day MA at 1.3288 100 day MA would be more bearish. The Asian session high came in at 1.33465. The NY session high just reached 1.33467- a fraction of a pip above the Asian high. Sellers leaned against the prior high and the price has rotated back lower. In the process, the pair is now back below it's 100 hour moving average of 1.33327. Overall, the range for the pair is only 46 pips. That is well below the 22 day average of 74 pips. So - like other pairs - there is some room to roam given a shove. The problem is shoves are hard to find in the market today with little on the economic or event calendar, but the levels are known. Watch the 100 hour MA for perhaps intraday clues. Crude oil- after trading down to $58.05 - is trading back above the $59.00 level. The high reached $59.17. That seemed to help weaken the CAD (higher USDCAD), but the sellers against the old high, stalled the rally.